Hi Friends! 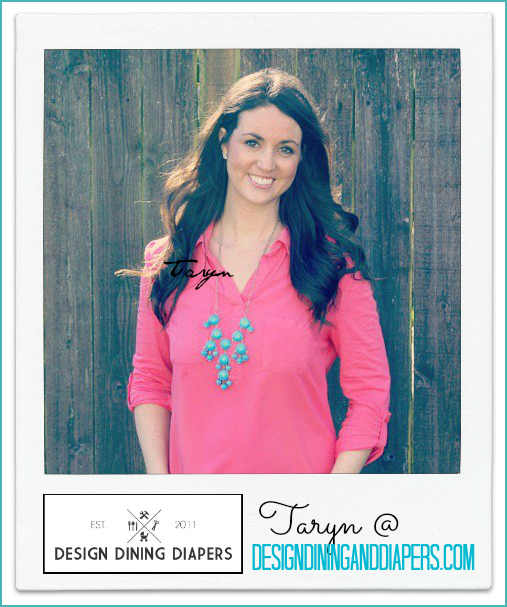 It’s Taryn from Design, Dining and Diapers. Are you like me and are always hunting for a deal? I just love it when I can browse through my favorite stores and see a beautiful piece that I KNOW I can make for less! 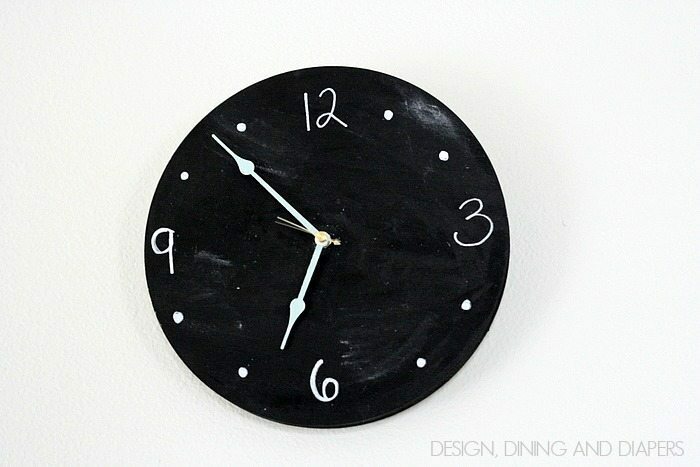 The other day I spotted this Chalkboard Clock over at Crate & Barrel and I fell in love with it. 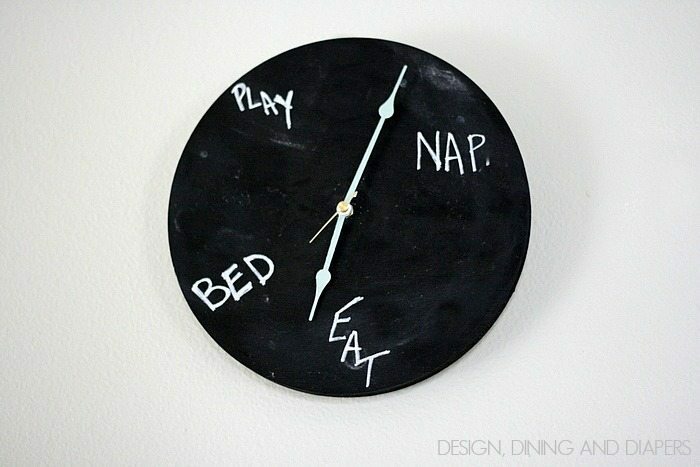 I thought it would be really fun to make one for my daughter’s room to help her know when it’s time for a nap and time for a snack. So instead of spending $60, I spent $20 and made one myself! And it can easily be done in TWO STEPS! 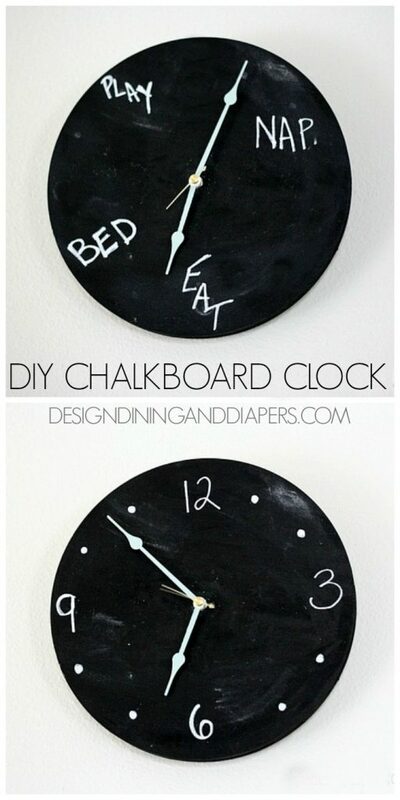 Start by painting the surface with chalkboard paint. 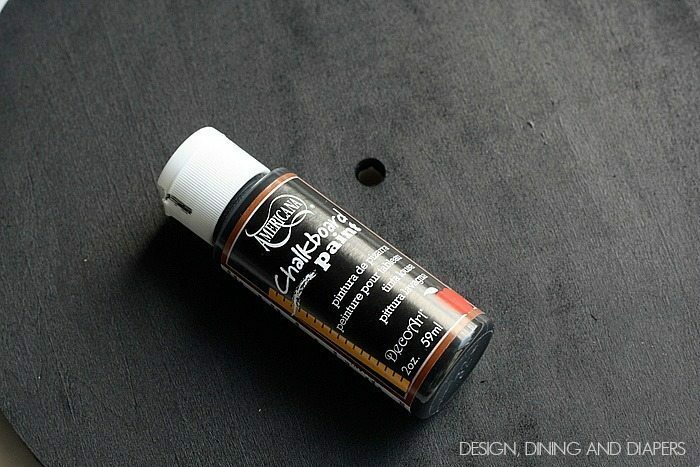 Two coats should be plenty. 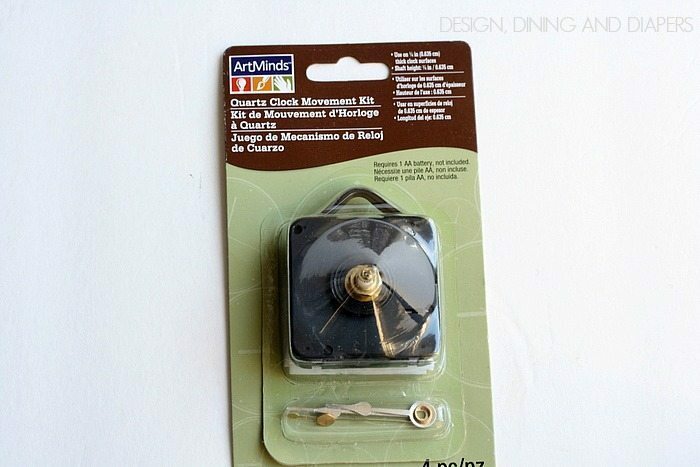 After it dries, install the clock kit. Make sure to buy the kit that matches the width of your wood. I made this mistake the first time! 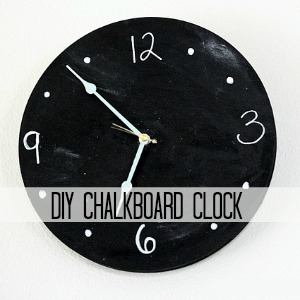 Note: I decided that I wanted longer clock hands than what came in the kit, so I spent $3 more to buy larger hands and then I painted them Annie Sloan Duck Egg Blue for a little accent color! This project honestly takes no time at all and could be done in TWO STEPS! And I love that you can customize it any way that you want. Thanks for having me over Desiree! 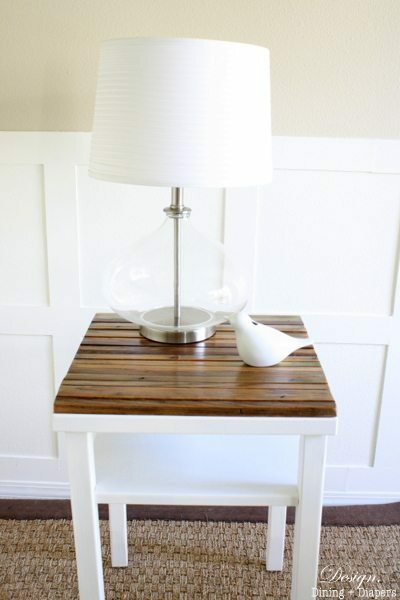 Here are some more projects from Taryn that we love. 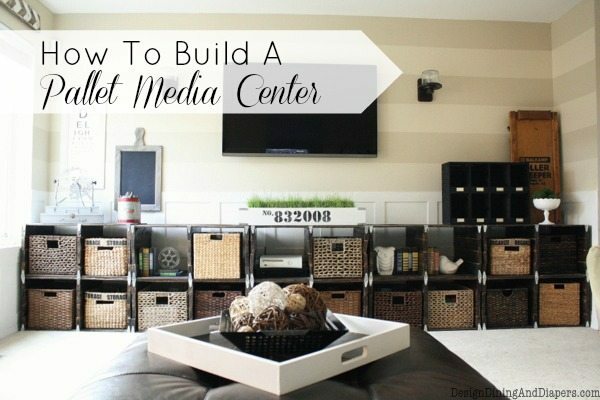 How to Build a Pallet Media Center Here. Great idea. Love it, Taryn! 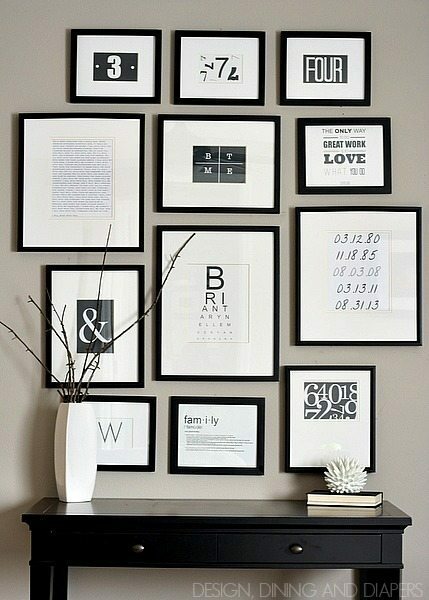 And I’m in love with your gallery wall too! Pinned. Thanks for sharing this cute idea! I love this! 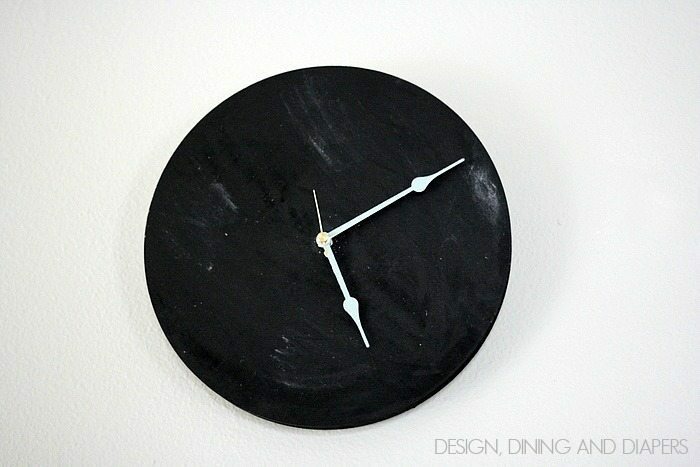 I want to make one for my kitchen! I love this Taryn! So fun! Thank you for the tutorial and the inspiration. I’m pinning for later.